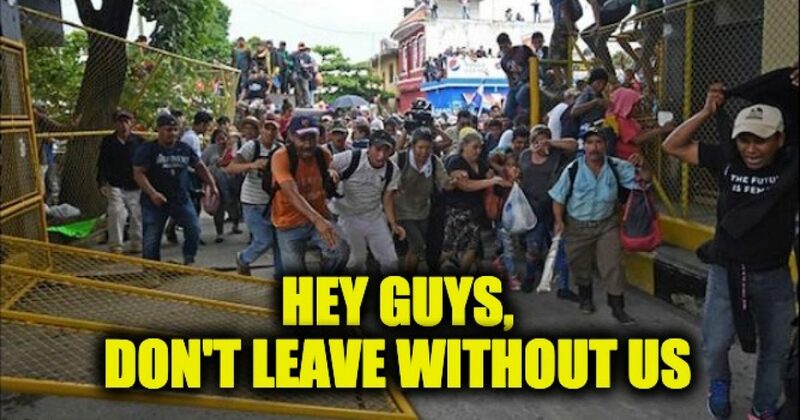 Illegal Migrants have stormed Mexico’s southern border and burst through the fence to join the latest migrant caravan, as Mexico tries to crack down on illegal immigration. ..the migrants were acting in a “hostile” and “aggressive” way and accused them of also attacking local police in Metapa, a Mexican village that lies between the border and the nearby city of Tapachula. The Epoch Times offered some interesting information about the ones who make it to the border. That’s what the POTUS has been telling America, but the Democrats refuse to listen. If they get some transportation help (and they usually do) after these immigrants who have trespassed into Mexico receive their papers, it will take only a few days before they reach the border between the US and Mexico and attempt to become Illegal immigrants in the US. And if they aim right, they won’t have to break through a fence, wall or any other kind of barrier, thanks to the tag team of obstructionists, Nancy Pelosi, and Chuck Schumer. If this caravan makes it into the U.S., they should stop at the first greeting card store they see and buy Chuck and Nancy cards thanking them for their hard work in making sneaking into America so much easier. Parts of this post were first seen at Godfather Politics.